Last week BlackBerry confirmed it would stop making its Classic handset – a design which harked back to the days of the Bold and Curve devices. Thing is, the message was misinterpreted by many and the Canadian firm has now taken to its blog for a second time to try and set the record straight. 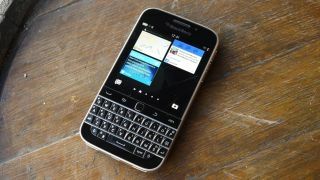 Some suggested it was the beginning of the end for the firm's iconic keyboard or even the BlackBerry 10 operating system, but COO Marty Beard wrote, "I made the rounds the past couple of days with the press to set the record straight, and the message was this – BlackBerry is not backing away from BB10." That means those using the BB10 platform (predominantly businesses) can be safe in the knowledge the software will be supported for the foreseeable future with Beard noting "future BB10 software updates for 2017 are already in the works. "Meanwhile, BlackBerry 10 devices such as the BlackBerry Passport and Leap are still available to our loyal customers." But what about new devices? While the commitment to the platform is clear, what's less clear is where BlackBerry is heading with its hardware. In this sense, it could well be backing away from new BlackBerry 10 handsets. Beard goes on to explain that there's still an appetite from users for a physical keyboard, and the firm will continue to create devices sporting the rows of buttons, but they may be running Android rather than BB10. "Priv was the first iteration… and soon there will be others" Beard said, but that sounds like more Android phones, rather than BB 10 devices. The BlackBerry Priv was an intriguing, and unique smartphone blending the BlackBerry keyboard with the Android OS, and it won't be the last. We've contacted BlackBerry for further comment regarding their device strategy for BlackBerry 10 and we'll update this article once we hear back.